Merville Galleries was launched in September 2012 by Thomas Lighton, and specialises in Twentieth Century Art, and Contemporary Art by established and emerging artists. The office is based in Sussex, but works of interest may be viewed by appointment in London, where they are held, or elsewhere by special arrangement. We will be delighted to advise on the sale or potential acquisition of particular works, whether privately or at auction. The service offered will be both personal, and above all confidential, and is aimed at experienced collectors familiar with the art market, as well as those wishing to start a collection. Advice can also be offered with regard to framing, restoration, shipping, storage and insurance. Thomas Lighton has thirty years experience of working in the art market, having been Managing Director at Waddington Galleries and more recently as a director of Agnew’s. 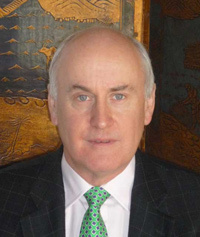 He has been Chairman of the Society of London Art Dealers (SLAD) twice, from 1993 – 1995 and again from 1998 – 2000: in this role he regularly represented Britain’s leading art dealers in discussions with the British Government and the European Union; he continues to be a special advisor to SLAD. or telephone 01798 865848 (office), 07989 517486 (mobile) for further information.